Seven mysterious riders decend on Leicester Square for a screening of the Magnificent Seven, released in cinemas this Friday. The Stunt horses performed tricks for onlookers before disappearing into the distance. There have been numerous sightings of seven mysterious riders around London this week. First spotted at the dead of night in the Wild West End, the cowboys have since been sighted crossing busy roads, leaving their horses at Boris Bike stations and chilling in London parks. They have culminated at the Cineworld Leicester Square to form an orderly queue for the new film THE MAGNIFICENT SEVEN, which is released tomorrow, starring Denzel Washington, Ethan Hawke and Chris Pratt. Commuters and tourists were shocked to see the impressive posse of seven authentically dressed cowboys arrive in the historic West End, with eye witnesses immediately taking to twitter. 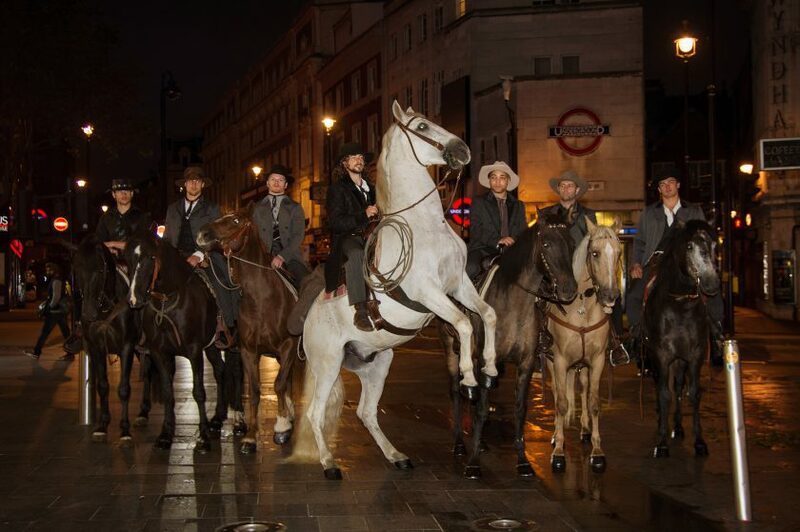 The horseback cowboys were part of a publicity stunt for the new film Magnificent Seven, released tomorrow (Friday). Director Antoine Fuqua brings his modern vision to a classic story in Metro-Goldwyn-Mayer Pictures and Columbia Pictures’ The Magnificent Seven. With the town of Rose Creek under the deadly control of industrialist Bartholomew Bogue (Peter Sarsgaard), the desperate townspeople, led by Emma Cullen (Haley Bennett), employ protection from seven outlaws, bounty hunters, gamblers and hired guns – Sam Chisolm (Denzel Washington), Josh Faraday (Chris Pratt), Goodnight Robicheaux (Ethan Hawke), Jack Horne (Vincent D’Onofrio), Billy Rocks (Byung-Hun Lee), Vasquez (Manuel Garcia-Rulfo), and Red Harvest (Martin Sensmeier). As they prepare the town for the violent showdown that they know is coming, these seven mercenaries find themselves fighting for more than money.